Every subtle shade in variegated thread helps build up the picture. The trouble I am having at the moment is that the weather is rainy and overcast and the light is dreadful. Everything looks a dull yellow under the electric light. At least I have been able to plot the main lines of the composition and am thinking ahead as to how I am going to stitch the bits in between. It is slow work. Here goes for Week 158. The project that caught my eye in Week 157 was LeeAnna's Van Gogh inspired quilt.. If you haven't seen her blog post yet, nip over now and have a closer look. Looking a bit dull so far, but next May my favourite field should be a sea of yellow. ... and I have chosen the threads. It is a bit daunting, so I shall only stitch a little at a time. Let's hope I don't mess it up. Here goes for Week 157. The project that caught my eye in Week 156 was Andrée's black and white wall hanging. If you haven't seen her blog post yet, nip over now and have a closer look. 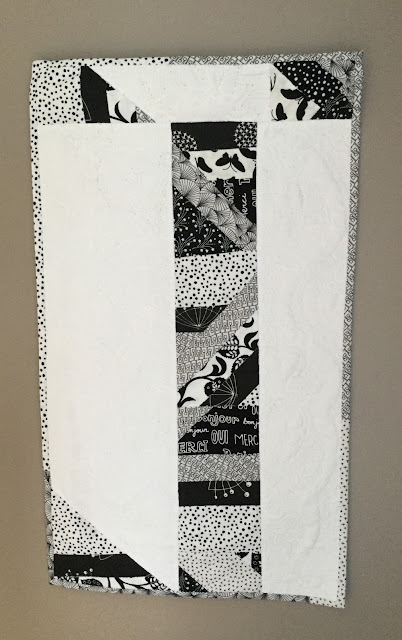 Linking up with Nina Marie's blog Creations... Quilts, Art.... Whatever for Off The Wall Friday. In shades of pink and grey with a splash of yellow, I have made a second twiddle blanket! To help tone down the pink and blend the colours together I used this fine knitting cotton to create a flecked effect. ... and thickened the pink and yellow yarns to the same weight as the chunky cream and beige, which can be seen on the left of this picture. The whole thing is finished off with buttons and knitted flowers, and is now ready for someone who needs a bit of extra warmth and comfort this winter. It's not so fascinating at this time of year, but the view from this particular spot is intriguing. It is something to do with the gentle undulations in the slope of the hill, the tractor tracks leading the eye to the trees, the angle of the sun. In the past I have stood here and captured a dramatic sky, fresh green shoots, golden wheat and bright yellow rapeseed. It's high time I stitched a landscape.